More additions to Brutus | Eastward! Yesterday I ordered a roofrack, awning and a shovel from a Swiss site. Normally a roofrack of a decent brand would cost up to €1300. This site sells a full roof covering rack for €399. It’s made in China, but apparently very sturdy and heavy duty (and also heavy weight, about 50kg). I stumbled upon a blog post on www.landcruiserclub.net where people were discussing this rack. I decided to take the gamble. 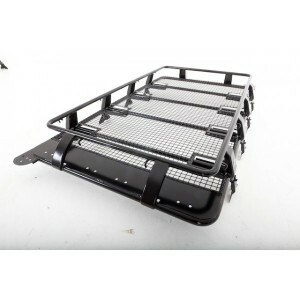 This site also sells a reasonably priced awning that can be mounted to the side of the roofrack. It’ll prove much needed shade to protect my sensitive skin and probably some protection to rain and snow when necessary. I can’t wait to receive, mount and test it all. It will serve to carry an extra spare tire, 4 jerrycans of diesel and possibly a snowboard and cross country ski’s, and the occasional wildlife I’ll hit on the way.